It seems reasonable to suggest that Jesus Christ will enter the Temple Mount via the Eastern gate in one of the most momentous events in the history of mankind (the Second Coming)! The Eastern Gate (also known as the Golden Gate) is one of eight gates built into the walls which surround the Temple Mount in Jerusalem. The Eastern Gate provides the only entrance from the East, and it is also the only gate that gives the most direct access to the temple mount. 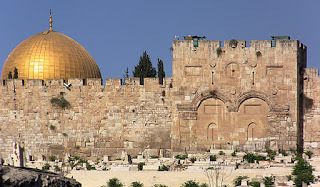 The Eastern Gate was destroyed during the Roman conquest of Jerusalem, and the subsequent destruction of the Temple in A.D. 70, thus fulfilling Christ's prophecy that "not one stone will be left on top of another" (Matthew 24:2). But sometime in the sixth or seventh century, the Byzantines rebuilt the Eastern Gate making it the oldest of all the gates to the city. 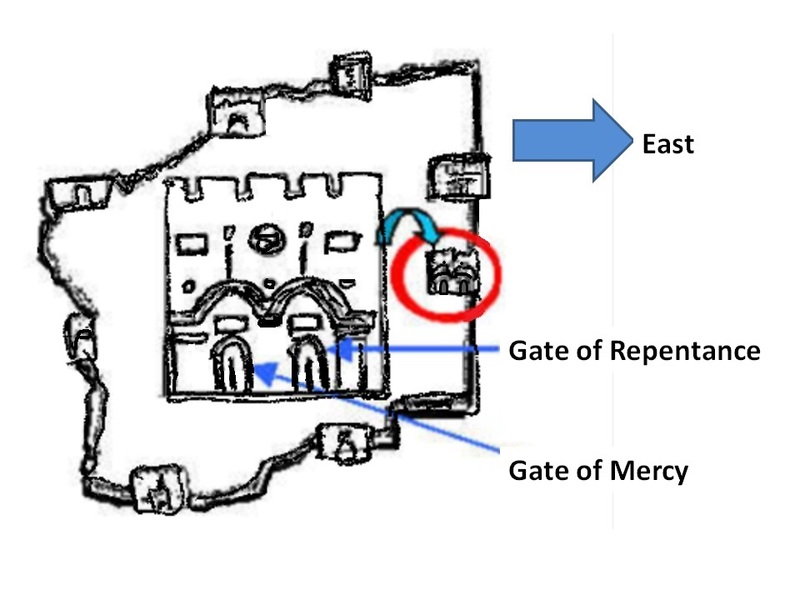 In 1969, Jerusalem archaeologist James Fleming confirmed that the ancient gate is located right under the current Eastern Gate. While investigating the Eastern wall of the Temple, he suddenly fell into a mass burial site and clearly saw five large wedge-shaped stones set into a massive arch. James Fleming's photo from 1969 from inside a grave on the outside of the Eastern Gate looking at the arch of an ancient Eastern Gate. The Eastern Gate was sealed shut, with fifteen feet of cement, in AD 1540–41 by order of Suleiman the Magnificent, a sultan of the Ottoman Empire. The reasons for this remain unclear, however, it is likely that the Muslim Suleiman became aware of the prophecies which predicted the Messiah’s entrance through the Eastern Gate and, as a result, attempted to thwart the Messiah’s plans. And just in case a sealed entrance didn't thwart the Messiah's coming, Muslims even built a cemetery directly in front of the gate, thinking that a Jewish Holy man would never defile himself by walking through a Muslim cemetery. There are eight gates in modern Jerusalem, but only seven are open. The Eastern Gate, and it alone, has remained sealed just as the Lord proclaimed to Ezekiel over 2,600 years ago! The first attempt was on December 9th 1917 during the Battle of Jerusalem. Muslim leaders in control of Jerusalem wanted all, but one, of the gates in Jerusalem sealed to deter the approaching allied Expeditionary Army led by the British General Allenby. The one gate chosen to remain open just so happened to be the Eastern Gate. On the exact day the workmen were preparing to demolish the mysterious sealed gate, Allenby's airplane flew over the city, telling the Arabs to flee. 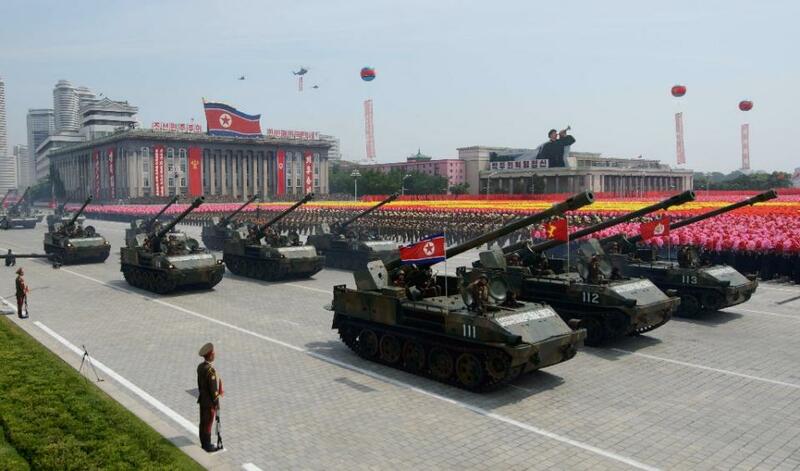 Miraculously, without a shot being fired, the opposing soldiers fled the city. The city was delivered into the hands of the Britain, and the gate remained sealed as Ezekiel had prophesied. A second attempt was in 1967. King Hussein of Jordan, who had control over the ancient city of Jerusalem, including the Temple Mount, decided to build a hotel for Arab pilgrims on a section of the Western Wall to close off the area to Jewish worship forever. The hotel was planned to be built over the Magreb Gate, which Moslems used to enter the Temple Mount. This meant another gate would have to be opened so that Moslems could still get to the El Aksa Mosque (on the site of the Jewish Temple Mount). King Hussein chose to open the sealed Eastern Gate. But, on June 5th of 1967, as the workmen prepared their air-hammers to shatter the huge stones sealing the Eastern Gate, an intimidating array of Israeli aircraft flew overhead. The Six Day War had begun, and the workmen put down their tools. At the end of the Six Day War, the workmen were unable to resume their project because the Jews had managed to recapture their ancient capital of Jerusalem. What a coincidence! There was another failed attempt around this same time. When the Six Day War first broke out, some members of the Jewish military suggested catching the Jordanian defenders of the city off guard by blowing open the sealed Eastern Gate. But the leader of the group, an Orthodox Jew, had vehemently protested the idea, stating that “the Eastern Gate can be opened only when the Messiah comes.” After a heated debate, they launched an attack at the Lion's Gate instead. "Israel's Housing Ministry wants to reopen a sealed gate in the wall ringing Jerusalem's Old City...The plan to break through the 15-foot-thick stone wall - part of a project to build up the Jewish ‘Quarter and increase its population - also is likely to anger the Palestinians, who oppose any changes in Jerusalem's eastern sector." Whatever came of this plan is unknown, but today, true to Ezekiel’s prophecy, the Eastern Gate remains sealed. The gate will remain sealed until the day when the promised Messiah will enter into His Kingdom. Its sealing is clear evidence that we are living in the end times, and given the amazing accuracy of this prophecy, we have no reason to doubt it will remain shut until the return of the Lord as this prophecy reaches its fulfillment. This gate is recently opened by the Muslims by force on the 22. Feb.2019! Anonymous, the Muslims only broke through the gates to the compound. The gate itself remains sealed. Thank you Joel, God's word stands true.